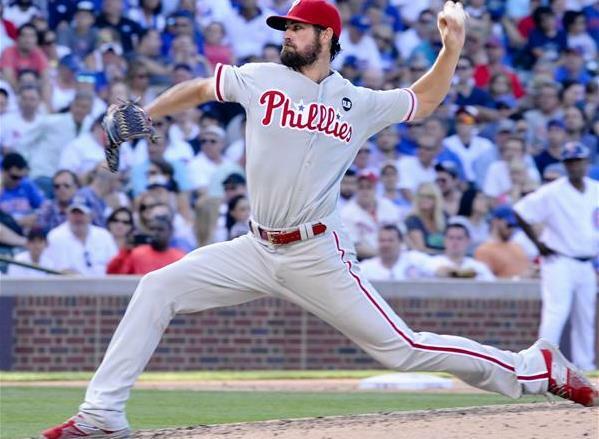 No, it doesn't appear the Cardinals will land Phillies starting pitcher Cole Hamels. Fans in these parts have been monitoring that scenario for months, hoping that a trade package of Tyler Lyons, Pete Kozma and a low-level prospect could bring another ace-caliber pitcher to town. Dream on, Cardinals fans. The Phillies need to make a major score by dealing Hamels -- and the Reds set a high bar for any such deal while dealing Johnny Cueto to the Royals. The Cardinals own plenty of starting pitching. GM John Mozeliak focused on relief help instead (Steve Cishek!) and stayed in the market for a first baseman with power. The Hamels Sweepstakes are building toward a Thursday or Friday conclusion, with the Phillies seeking best offers by today. Cole's next start was pushed back to Friday to accommodate all the chit-chat. Does that mean LA is out on Hamels? Well, maybe. Because . . . Tigers baseball czar Dave Dombrowski reversed course and put David Price up for bidding this afternoon, along with power-hitting outfielder Yoenis Cespedes and others, including Alex Avila, Rajai Davis and Alfredo Simon. Again, the Cueto trade package set a high and appealing bar and the Tigers could sure use an influx of young talent. The Cubs, Yankees and Astros could go after Price, along with the Dodgers. The Astros could go after Cespedes, along with the offensively challenged Mets, Twins, Angels and Orioles. Two executives earlier this week said Phillies should trade Hamels soon so potential Price availability doesn't change their market. Oops. Hamels' long-term deal does keep him desirable to teams like Texas looking long-term. Tough to leverage them when others can turn to Price. Could this be a Friday conversation? "Cole, we can trade you to a contender, but not one you prefer, or you can stay here. Your choice." Can see why Detroit wanted to hold onto Price. Difficult to come to terms with missing your window. This is the Tigers' officially shutting. Do the Cubs get a say in the Price trade talks? Like, to tell whoever trades for him to take it easy so he's not hurt when they sign him? In David Price trade talks, #Tigers expected to prioritize major-league-ready starting pitchers. Dodgers, Giants, Blue Jays have them. SF presence in Price talks fascinating, because they don't have a lot of pressure to do something… But they do tend to make WS-worthy moves. Cardinals certainly could get into the Price market if they make Alex Reyes available. Huge arm. One reason Price market was depressed a year ago was because few teams could afford him in $20M range for final year of arbitration. The number of teams interested in Price will be greater now. That alone should help #Tigers, who hold the most attractive rental on market. Theo Epstein loved Yoenis Cespedes coming out of Cuba. He will explore his availability as a rental piece. Tigers in full sell mode. Rival evaluators think SD could have flurry of deals in next 48 HRs, or high volume deals, w/impending FAs--Upton, Kennedy, Benoit, Venable. The #BlueJays continue to cast a wide net in starter search. Gallardo, Leake, Cashner, Ross, Fiers, Haren all on the radar. Third club in #Dodgers-#Marlins believed to be a team that winds up with Michael Morse. He has no apparent fit on the Dodgers roster. #Orioles are holding the line on trading Kevin Gausman or prospect Mychal Givens for an impact bat at the deadline. #Braves are getting lots of play on Jim Johnson at the deadline. He has a 2.25 ERA and is only making $1.6M this season.